Well, it’s been a while since my last blog and true to form it has been largely down to one of the ‘W’s mentioned in my last post…. Work. Saying that though although the weather has been dry it has been windy down here on the South Coast so probably limited opportunities to get out on the kayak anyway. Anyhow, I digress…. This article is all about getting rigged for fishing on the kayak. 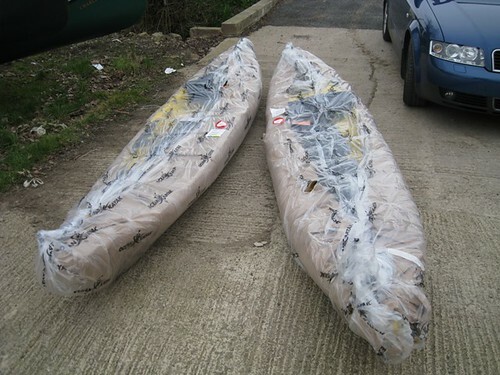 As I mentioned in a previous article getting the kayak is not even half the story when it comes to kitting out. I haven’t totalled up what I’ve spent on kitting the yak out but I wouldn’t mind betting it’s over doubled the initial outlay for the kayak and the paddle. For starters there’s safety kit…. I’m not going to give a huge list of what you should and could have – there are other forums and sites on the internet with a wealth of information far more extensive than I can list or am experienced enough to talk about. I reckon with a bit of common sense and talking to experienced yakkers most people will be able to get the basics right. So, what have I gone for? Well, a ‘lifejacket’ or in the yakking world a personal flotation device (PFD) for starters is a must. If you want to stay dry then a dry bag/suit is needed – I went for a two-piece number in the form of a bib and braces with a cag over the top which has served me well to date. However, in retrospect I do see the advantage of an all-in-one suit to reduce the risk of water getting in. In addition I’ve managed to accumulate wet suit boots, gloves, hats, flares, VHF radio, leashes, a towline, dive knife, leashes, a safety light, and a whistle …. all in the name of safety on the water! In terms of rigging the yak itself again I’m no expert and again would suggest you hunt out other sites on the internet where you will see no end of ideas on how to rig your yak and believe me there are infinite possibilities. Both Nobby and myself have been extremely fortunate in the early days of out kayak fishing to stumble upon an experienced yak fisherman, Rob Appleby, who has helped us get rigged up and provided much sound advise. Without wishing to embarrass him it really is worth taking a look at Rob’s blog for some cracking and sensible ideas for rigging out your kayak as well as reading through his experiences – it comes highly recommend. As for my trusty Trident I’ve added to it a couple of access hatches, one at the stern and one on the RodPod, an anchor trolley, and two rod tubes as permanent fixtures. In addition to this there is a removable 12v battery that powers a fishfinder, GPS unit and for night fishing a stern light. 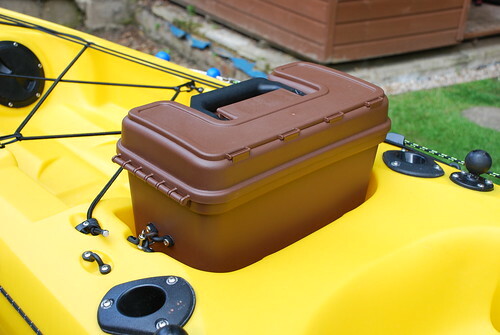 Other removable items include a seat, a dry box in the small tankwell behind the seat and then either a yak bag or a crate for the main tankwell. 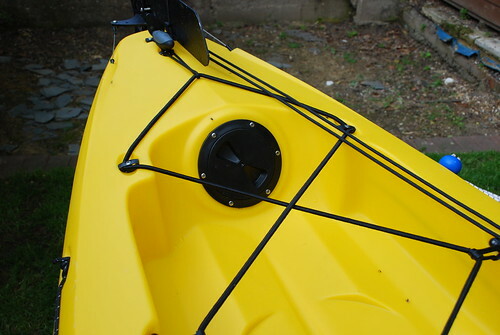 I’ve also got an anchor setup which attaches to the anchor trolley and a trolley to wheel the yak around. All this and I haven’t even mentioned the fishing kit for which you’ll need more leashes to keep it all on the yak! I’ll save that for another blog…. after I’ve got some fishing in. 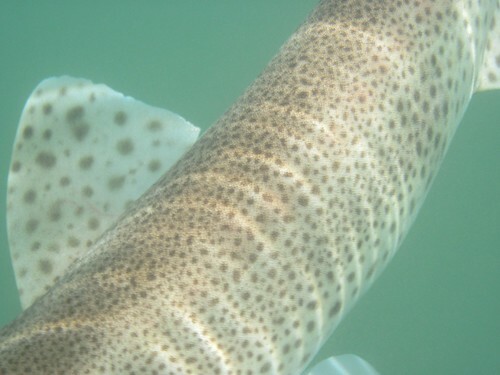 Author Andy PhillipsPosted on June 22, 2010 Categories Kayaks, RiggingLeave a comment on Gettin’ rigged…..
Now you might think I’m going to talk about kayak fishing resources on the internet here but I’m not. The ‘WWW’ effect to me are the three things that generally stop me fishing…… Work, Wife and Weather – and usually in that order but beware because if one of the ‘W’s doesn’t get you, you can be near as damned sure that one of the others will do their level best to scupper even your best laid of plans. I’m not trying to stay in the good books here, well, maybe just a little, but the lesser of the three evil ‘W’s when it comes to my fishing time is the ‘Wife’. She’s a good sort and in the majority of cases I think she’s quite happy for me to disappear down the road with fishing and kayak kit almost falling out of the car. The problem is usually when the other two W’s are looking favourable and I have a plan hatched for the upcoming weekend and she mutters those fateful words …… “You have remembered we’re going up to my parents this weekend? It’s on the calendar.”…… Of course I hadn’t, I’m a man, how the hell was I to know or remember to look at the calendar when all I had been so focused on was fishing venue, what the tides were doing, what bait to use and the other two W’s?! It’s frustrating when this happens and sometimes you just have to take it on the chin, plus as I see it, there is a flip side that can be advantageous…… let me explain. The good thing about the ‘Wife’ is that of the the three W’s it’s the only one I find you can at least score some decent Brownie points with for future fishing expeditions. ‘Work’ is less flexible and with the ‘Weather’ you’re in the lap of the Gods or should I say the dodgy weather forecasters – more of them later. The key is to keep yourself in good credit with the ‘Wife’ by entertaining some of her plans, keeping ahead of jobs around the house and generally keeping her sweet. It’s no use lying to yourselves lads, even the most brazen of you yak fishers out there has to tow the line at some point in the proceedings. So, yes, the ‘Wife’ can be a hindrance but played correctly this is usually the easiest, and most likely, the only one you can manipulate! …… I never know whether to scream, laugh or cry. What can I do? It’s a necessary evil is this ‘W’ and I need my job to pay for my fishing in addition to other not so important things like a mortgage, food and bills. I find it so maddening and this is just an example of the many ‘Work’ related matters that frustrate the hell out of me. Each and every one of them has the affect of making me late or putting a sledgehammer through my meticulously laid plans. Finally, we come to the ‘Weather’ and maybe more specifically it should be ‘Weather’ forecasters. The ‘Weather’ is the one thing you don’t have even the slightest influence over and can only plan for based on the information put out there by these so called ‘Weather’ forecasters whether it be on TV, radio or, more likely these days, internet weather channels. 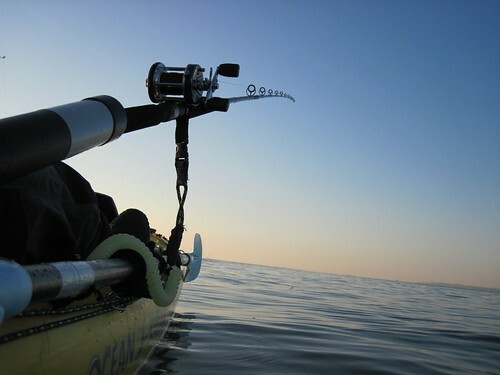 Particularly for kayak fishing the wind is all important – both the direction and the speed. Rain and cold you can cope with but the wind is the key. So, why is the ‘Weather’ so frustrating? I’ll tell you why…… again, picture the scene – there have been no murmurings from the ‘Wife’, you’ve escaped from ‘Work’ unscathed and the ‘Weather’ forecast when you checked an hour ago was perfectly do-able. The sun is out, you load your kit on and in the car, say your farewells, drive to your chosen venue, walk down to the shore…… and the sea is cresting with white horses with a nice swell to boot. What happened to the predicted 3 to 5 mph winds Mister ‘Weather’ Forecasterman – tell me that eh!? In my eyes it’s not a forecast at all it’s simply a ‘best guess’ a lot of the time but I suppose the job title of ‘Weather’ guesser doesn’t fit the bill even if it is a more accurate description! It’s not all the forecaster/guessers fault though. Sometimes when you get a combination of ‘Work’ and ‘Weather’ that can really leave you in shreds and it happens…… you’ve been hard at ‘Work’ all week and the ‘Weather’ has been a dream for kayaking, open the curtains Saturday morning and it’s blowing a hoolie with lashings of rain for extra measure to rub salt into your already smarting wound. You can feel almost fated with bad luck at times. So there you have it – the three W’s that a majority of the time prevent me from getting out there on the yak and fishing. Whether it’s one of them or a subtle combination of two or all three of them believe you me they’re all out there to wreck your plans! Speaking of which I’d better get back to one of the W’s now…… ‘Work’… and yes, the ‘Weather’ is perfect outside! 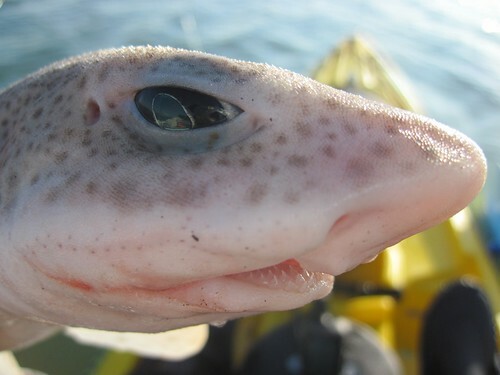 Author Andy PhillipsPosted on June 4, 2010 Categories Fishing frustrations1 Comment on The WWW effect …. 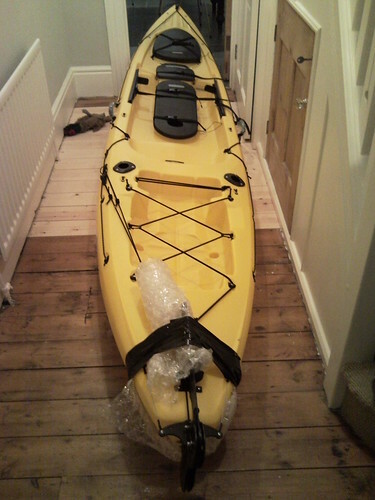 As I hinted in a previous post, once the seed was sewn on the idea of getting a kayak the thought process gained momentum pretty quickly and both Nobby and I began to explore the options. The obvious starting place was the internet to get some sort of idea of what was available on the market. There was quite a range of options out there for us wannabee yakkers but we decided at an early stage that it was the sit-on-top variety that we felt ticked the right boxes. Nobby was keen on the Prowler 13 Angler while I was more in favour of either the Trident 13 or The Big Game. Both the Prowler and the Trident looked more streamline than the Big Game which seemed bulkier although more stable. In the end, after a trip to The Family Adventure Store in Trowbridge we opted for the Trident which seemed to be in the middle of the Prowler 13 and The Big Game but with the advantage of features such as the RodPod and the Sonar Shield. Within a week of our visit the orders were placed and we patiently waited then for 6 weeks until we got the call to say they had arrived. When we picked up the yaks it was just like Christmas as kids all over again! We even had the added bonus that they’d shipped them with rudders already fitted by mistake which was a real result. … and here was my yellow piece of heaven unwrapped on the hall floor when I got it home! Now we had the yaks… but that wasn’t half the story, we now needed kit to wear, safety kit, different fishing kit and not to mention modifications we’d undoubtedly want to make! It was now that the real fun and expense began! I warn any of you out there thinking of buying a kayak it is a huge addiction what with the tinkering and the accessorising! Eighteen months on I am generally pleased with the decision to get the Trident but in retrospect I can see big benefits in the Big Game Prowler namely the stability it offers and I am not wholly convinced that the RodPod design on the Trident is as good as it could be. Maybe I’m being picky here though really as overall the Trident is a good kayak in my opinion. Author Andy PhillipsPosted on May 29, 2010 Categories In the beginning..., KayaksLeave a comment on Decisions, decisions…. Ok, I know…. my last blog entry said I’d be talking about the kayak choices I explored before buying but as I warned you in my ‘Welcome’ spiel my blog could be a bit of a mish mash of articles and so it is! The reason being is a window of opportunity to get myself on the water presented itself on Monday and I grabbed it with both hands. It wasn’t a huge window but certainly enough time for me to make a trip to one of my local Solent haunts. 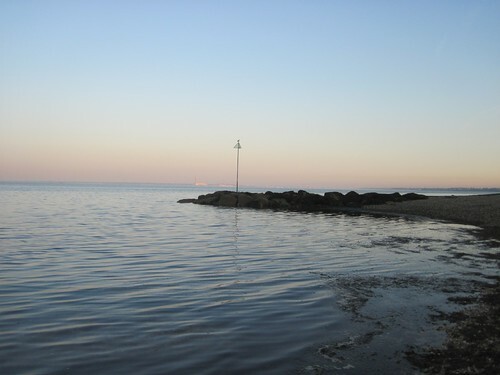 The venue I went to was Lee-on-Solent and to be more specific launching from the Elmore slipway at the southern end of the main promenade. It’s a good spot to launch with a quiet car park and a short distance to the shore. I was at the launch site at 5:30am and it was absolutely perfect conditions with no wind and the sea almost glass like – ideal for ‘yakking’. The launch site is very shallow but approximately 300 metres out the seabed starts to drop off and deepens to roughly 6 to 7 metres. The mark I was heading to is just under a kilometre off shore where there are a couple of troughs in the seabed of around 11 metres in depth. 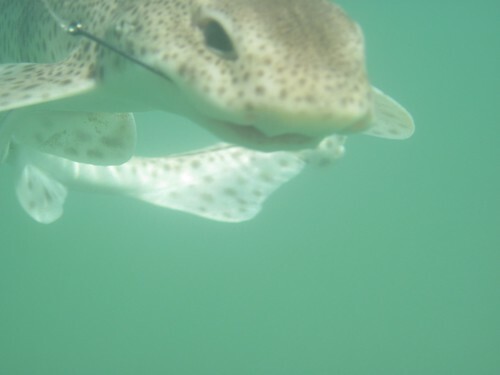 I’ve fished here a couple of times in the last month or so and have had limited success with an abundance of dogfish interspersed with a few smoothound pups which are now showing along this part of the coast. With only squid and mackerel as bait I wasn’t expecting anything other than these two species and neither let me down in this respect. 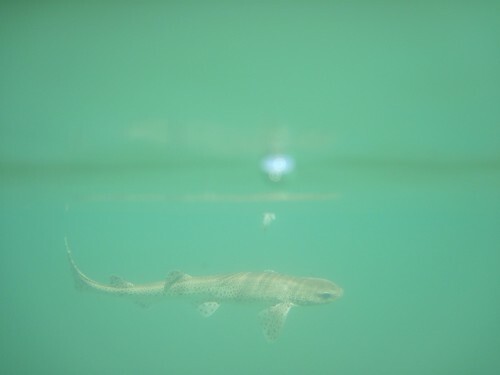 And it wasn’t long before that first bait yielded the first fish of the day either in the form of a starry smoothound pup – no more than about the 3lb mark but a beautifully marked fish all the same. Even the pups put up a decent scrap so when the bigger one’s arrive soon it will be excellent sport on the kayak! 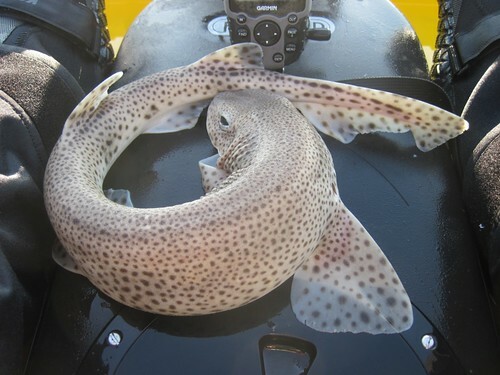 After the tide turned even the dogfish bites slackened off to nothing and for a while I found myself just enjoying being on the water watching the world go by in peace and quiet. 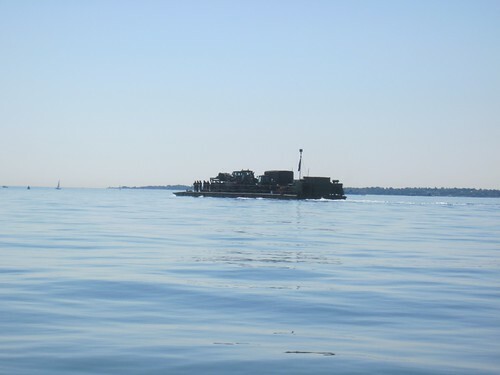 On The Solent you can see no end of different watercraft on the water from windsurfers to cruise liners but today, shattering my peace and quiet, were the army with all their kit on manoeuvres on a very noisy barge! This must have awoken the dogfish as well as not long after they were on the feed again and I finished off my bait with a few more. 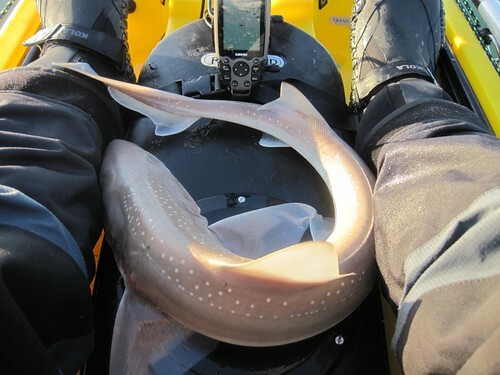 This time I thought I’d take the opportunity to picture one in the water… a small price to pay for their greedy antics! A pleasant morning on the water in the best conditions on The Solent I’ve experienced. I was back on dry land by 11:30am de-rigging and ready to head home… to work in the afternoon. It was about this time two years ago that my good pal Nobby and I were trudging back to our cars along the Dorset coast somewhere between Kimmeridge and Worbarrow Bay after a fruitless attempt for an early season bass. We tried to reason that maybe we were using the wrong tactics, the sea and weather conditions weren’t right and made countless other excuses for our poor early season form. “I reckon we should get kayaks” were the words that Nobby blurted out. “You know, fishing kayaks, I’ve seen a few of them around” he replied enthusiastically. And so it began… not immediately but make no mistake the seed had been sown and the beginnings of a plan were hatched. It was finally executed early in 2009. It wasn’t that we weren’t enjoying our shore fishing it was just the catch rates were relatively modest plus we’d already found ourselves doing less and less traditional beach fishing with big rods, reels and a mountain of tackle and concentrating our efforts on light gear, lures and fishing on the move. 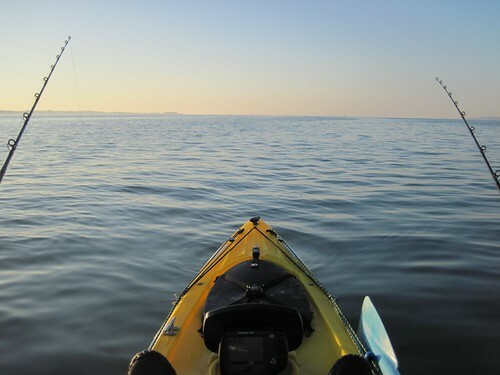 Even this was hit and miss though and once the wheel was set in motion the idea of kayak fishing became increasingly appealing to get us to inshore waters inaccessible on foot and to allow us to fish in deeper water a little further out. We toyed with the idea of getting a boat between us and even looked at a couple but neither of us was particularly blown away with what was on offer for our budget, nor did we really have the space at the time to keep it or the time to maintain it properly. 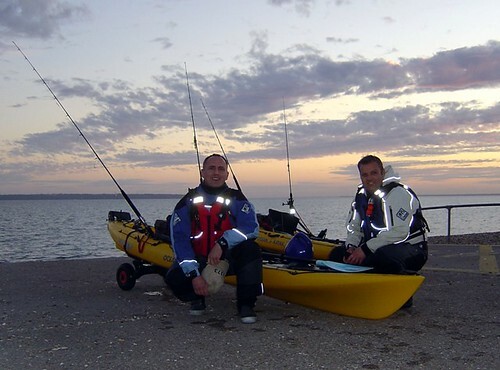 We both liked the idea of being able to throw a kayak on the roof of our cars and head off to wherever the will would take us…… little did we know then that with the combined cost of kitting out the yaks we could probably have bought a semi-decent boat and had change in our pockets but as is said “what’s done is done!”. However, even in retrospect I wouldn’t change that decision – I like the freedom you have with a kayak to take it virtually anywhere you please, launch from a beach and even get to those fishing spots you just couldn’t get to sensibly even with the smallest of boats. Once we’d made up our minds it was an option we were committed too, the next stage was research and to explore the kayak options available to us on the market…… that will be the subject of my next post. 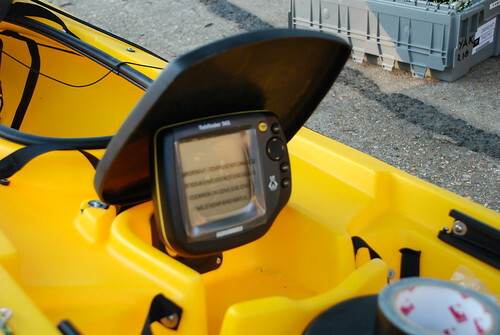 Author Andy PhillipsPosted on May 21, 2010 Categories In the beginning...Leave a comment on So, why a kayak? Well, where do I start? I’m sat here head in hands pondering how to open my blog and being devoid of any inspirational words I’m guessing, and you’re probably hoping, that my opening gambit will be relatively short. I will try to keep it that way. 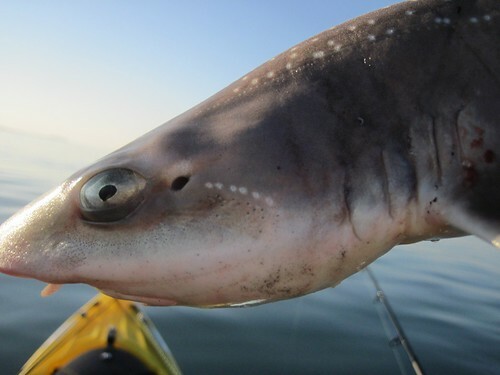 As my blog name suggests the purpose of my writing is to provide a journal about my favourite pastime of sea fishing and, largely but not exclusively, my kayak fishing experiences. You see, I am a keen lure fisherman too and when the elements don’t permit the use of the ‘yak’ then I am more than content taking a rod, reel and a few plugs to the shoreline chasing a bass. However, within this remit I don’t want there to be any boundaries as to what my blog will focus on….. my intention is to have a jumble sale of articles whether it be on fishing reports, useful resources, the occasional tackle and kit reviews, venues, what I’ve learnt and am still learning, and even reasons why I couldn’t go fishing! I make no apology if it turns out to be my predicted ‘mish mash’ of articles but hopefully this will make it interesting, mildly humorous and have the reader coming back for more?! Right…. that’ll do for now……hopefully that was short enough as an opener?! Author Andy PhillipsPosted on May 20, 2010 Categories Welcome3 Comments on Welcome to my blog!